What do human lice look like? 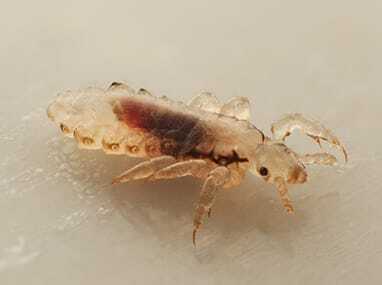 Lice are wingless parasitic insects. There are thousands of species found living all across the world. The three most common types of human lice are: body lice, head lice, and pubic lice. Body lice and head lice are two different species but are very similar in appearance. Adults grow to about 1/8th of an inch in length. They have a long, flattened body; and are whitish yellow. Adult pubic or “crab” lice grow to be about 1/16th of an inch in length, have a broadly oval body that is flattened, and are crab-like in appearance. Where are human lice found? Head lice are found almost exclusively living on the head, mainly being found at the back of the scalp and the area above the ears. They attach their sticky eggs (nits) to the hair on their host’s head. Head lice are transmitted through personal items like combs, hairbrushes, or hats that are infested with lice and come into contact with a person; they can also be transmitted by head to head contact. Body lice are typically found living in clothing. They attach their eggs to clothing fibers, and adults will stay attached to their hosts clothing as they feed on their body. They are rarely ever found crawling on their host’s body. These lice are usually spread by sharing infested clothing. Pubic lice are found living in people’s eyebrows, beards, armpits, and pubic region. They attach their eggs to the flat hair found in those areas. Pubic lice are most often spread through sexual contact. What do human lice eat? These parasitic pests feed on the blood of their human hosts. The best way to prevent the spread of human lice is to make sure that you and especially your children do not share clothing, hats, combs, brushes, and other personal items. If your children are in a school setting, make sure to wash coats, hats, and other items that they bring back and forth on a regular basis. It is also a good idea to regularly wash bedding, clothing, towels, and like items. The best way to control human lice is to seek treatment as soon as an infestation is discovered. Human lice are not capable of living without a host for a long period of time; because of this, a human lice infestation is not something that can be taken care of by a pest control professional. The only effective, safe control for human lice is to seek treatment from a trained medical professional. At the first sign of a human lice infestation, a physician should be contacted.